Turn up the heat, and ice will melt. The effect of climate change on the world’s ice is almost that simple. Global temperatures are warming, and that warming is fastest at the poles. As a result, ice sheets and glaciers melt and shrink. So while there's still lots of snow and ice in the polar regions, there’s much less of it than there used to be. Antarctica's Ross Ice Shelf at the Bay of Whales. Meltwater from the ice sheets and glaciers flows into the ocean, causing sea levels to rise. This can lead to flooding, habitat destruction, and other problems. Ice reflects the Sun’s energy better than than land or water. So with less ice, Earth absorbs more energy, and heats up faster. Many animal species rely on icy habitats to survive—polar bears, seals, foxes, wolves, and many others are threatened by global melting. Ice also holds secrets about Earth’s climate history. By drilling into Antarctica’s ice sheets and extracting ancient layers, scientists can measure what the climate was like over the last 800,000 years. The orange line shows the normal (median) ice coverage for that day, based on measurements from 1981–2010. Because of rising temperatures due to climate change, you'll usually see less ice than the normal line. Arctic sea ice coverage is shrinking by 3% or more per decade. And some climate models suggest that if CO2 emissions continue to rise, the Arctic Ocean could be nearly ice-free by 2050. Without ice cover, land or ocean water reflects much less sunlight. And when the Sun's energy isn't reflected, it gets absorbed, causing the ocean or land to heat up. So the more ice melts, the more sunlight the planet absorbs, and faster it warms. When sunlight hits sea ice, about 90% of the light energy gets reflected back toward the atmosphere. But ice-free ocean water reflects only 6%, and absorbs the other 94% of the energy as heat. Read more about albedo. In one respect, melting sea ice isn’t as bad as melting ice on the land. That’s because sea ice floats, and like melting ice cubes in a cold beverage, it doesn’t raise sea level when it melts. To learn more about ice, freezing and melting try the Ice Balloons Science Snack. The orange line shows the normal (median) ice coverage for that day, based on measurements from 1981–2010. In spite of climate change, Antarctic sea ice has been growing by about 1.8% per decade. Scientists aren’t sure why, but they think it may be caused by the frigid ocean current that surrounds Antarctica, and by the continent’s icy winds. Though Antarctic sea ice is growing, the ice sheets on the continent itself are shrinking—by an estimated 219 billion metric tons per year, as of 2018. This melting appears to be accelerating, and is contributing to sea level rise. The Antarctic ice sheet has lost more than 1,000 gigatonnes of ice since 2002, according to ice mass measurements from NASA’s GRACE satellites. The multicolored line in this graph shows the carbon dioxide (CO2) levels in Earth’s atmosphere, measured in ice core samples from Antarctica. It goes from 800,000 years ago to about 1978. Over hundreds of thousands of years, Earth's CO2 levels rose and fell, but they never got above 300 parts per million—until the late 1800s. That’s when humans began generating CO2 by burning more and more fossil fuels for energy. After 1850, the line rises so fast that it looks almost vertical. This clearly shows that CO2 levels are much higher today than at any time in the last 800,000 years. And direct CO2 measurements reveal that it’s still rising higher every year. How Does Ice Tell Us the Climate’s History? Antarctica’s ice sheets formed very slowly over thousands of years, as each year’s snowfall became compacted into solid layers of ice. When each new ice layer formed, it trapped tiny bubbles of air—like bottled samples of the atmosphere from that time. By drilling down into these ice sheets, scientists can measure the gases that were in Earth’s atmosphere many centuries ago. As Antarctic snow builds up over many years, the layers underneath become harder and more dense. The bubbles in this ice from an Antarctic ice core contain carbon dioxide and other gases, trapped thousands of years ago when the ice formed. Researchers carefully crush the ice and capture the gases that escape to measure the CO2 levels. While past CO2 levels don’t tell us how warm the climate was, other trapped gases can. Data from oxygen and other gases show that ice ages happen when CO2 levels are low, warmer periods happen when CO2 levels are high. The yellow line rising from left to right shows the total sea level rise caused by melting glaciers from 1961 to 2003. The total amount of sea level rise from glacier melt—about 2 centimeters (0.75 inches)—might sound small, but even a couple of inches causes increased flooding in coastal regions like the Bay Area. As glaciers melt faster, the yellow line is getting steeper—sea level rise is accelerating. Glaciers naturally fluctuate over time. They advance in colder years, and retreat in warmer years. But in recent decades many glaciers have retreated to a stunning extent. Muir Glacier, Glacier Bay, Alaska in 1941, 1976, and 2004. McCarty Glacier, Kenai Fjords National Park, Alaska in 1909 and 2004. The retreat of Qori Kalis Glacier in Peru between 1976 and 2004 left behind a large lake. Glaciers are relatively small ice masses, but Earth also has two gigantic ice sheets. They cover the majority of Greenland and Antarctica. 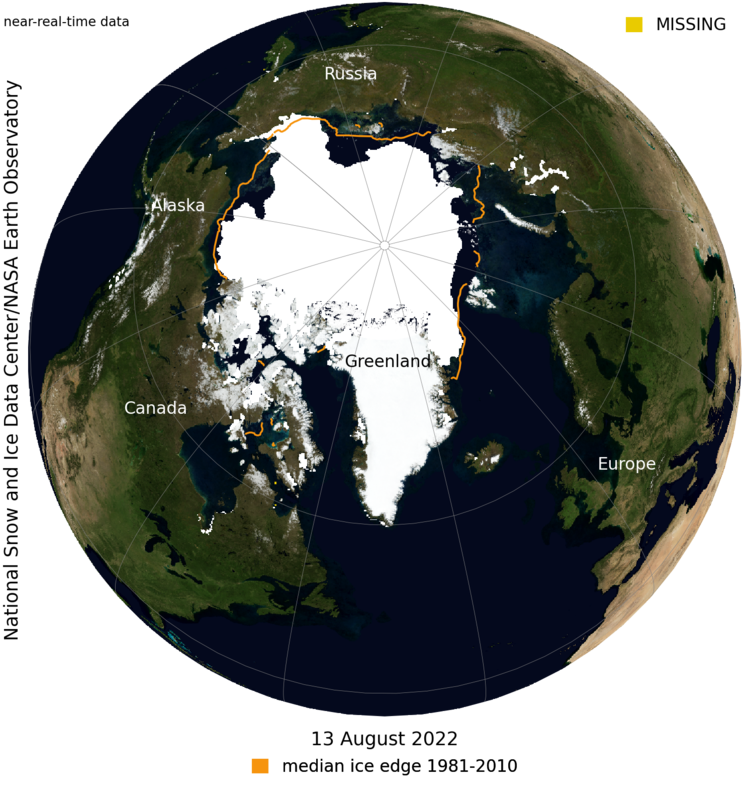 Both of these ice sheets have been losing mass since 2002, and that melt is accelerating. Like the melting glaciers, that’s causing sea levels to rise. These satellite images from January to April 2002, show the collapse of the Larsen B Ice Shelf on the Antarctic Peninsula. On January 31, the ice shelf (left) is dotted with blue pools of meltwater, forming lines above crevasses in the ice. A smattering of icebergs appears in the dark, open waters. By February 17, the shelf begins to splinter. The leading edge has retreated about 10 kilometers (6 miles). By February 23, several more long, narrow icebergs have broken away. By March 7, the shelf has disintegrated, filling the bay with a mixture of slush and icebergs. Many of the bergs have toppled over, exposing the very pure blue ice from the bottom of the shelf. The following summer, when the seasonal ice melted, the icebergs began drifting away with the currents. And during many summers since then, the bay has been completely ice-free. The collapsed part of the Larsen B Ice Shelf was larger than the state of Rhode Island. It was the largest in a series of retreats of the Larsen Ice Shelf. Larsen A Ice Shelf, just to the north, collapsed abruptly in 1995. Smaller sections of Larsen B broke away between 1998 and 2002. And Larsen C Ice Shelf lost the second largest single iceberg ever recorded in 2017. Antarctica has numerous ice shelves. Those on the Antarctic Peninsula have been shrinking in recent years. Source: Based on maps from NASA. 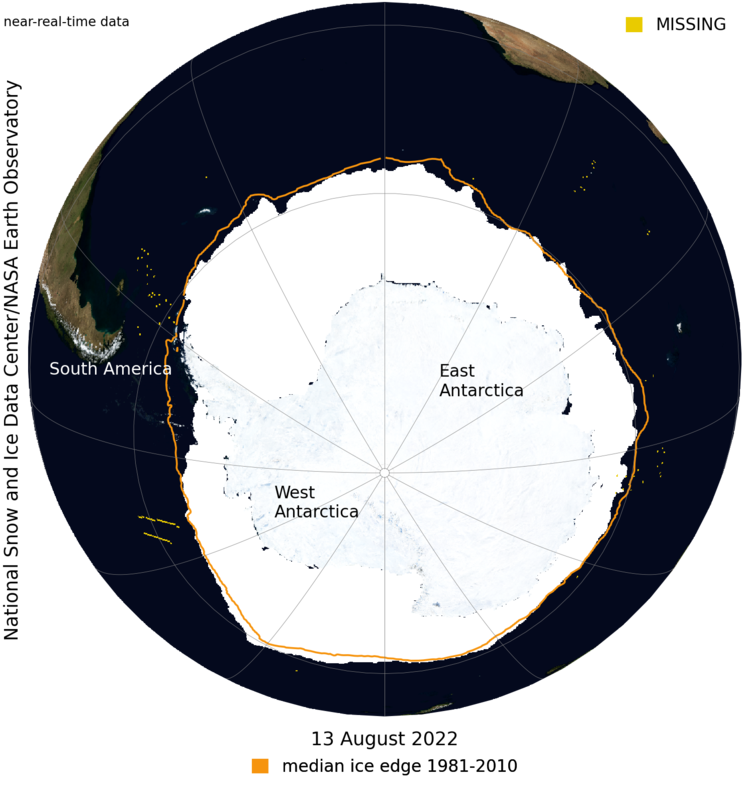 The Antarctic Peninsula, where the Larsen Ice Shelf is located, has warmed more than the rest of the continent. And scientists believe the collapse of the Larsen B Ice Shelf was at least partly caused by warming temperatures. The rest of Antarctica is cooling, and its largest ice shelves are gaining mass. For example, the Ross Ice Shelf (south of New Zealand) is thickening as the glacier streams connected to it slow down. What Is an Ice Shelf, Anyway? An ice shelf is a thick plate of ice that extends out over the surface of the ocean, and is connected to an ice sheet (land ice) at the shoreline. Because an ice shelf is already floating, its disintegration doesn’t immediately make sea levels rise. But an intact ice shelf pushes back against the ice sheet or glacier behind it on the land. So when the shelf collapses, the ice sheet flows and melts much faster (though still at a glacial pace) into the ocean. And melting ice sheets do increase sea levels.